The Great Western railmotors had many fascinating and unusual features, some of which were also used on the subsequent autotrailers, but are not otherwise found in Great Western carriage design. 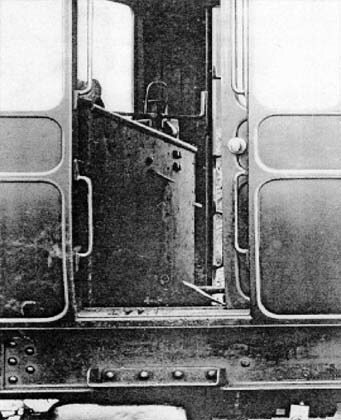 The arrangement in the Driver‘s vestibule of 190. 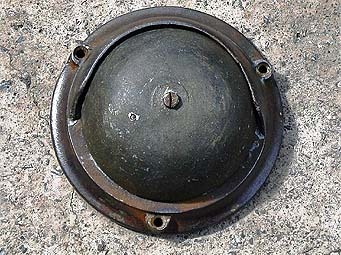 A close view of the electric bell showing the distinctive dust shield over the gong. 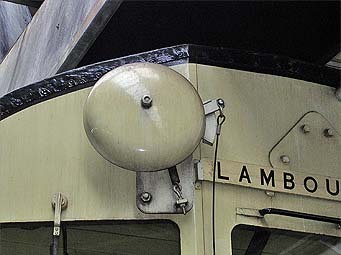 To enable the Guard to communicate with the driver and fireman an electric bell system was provided, with push – buttons and bells in the Driver‘s vestibule and the Motor compartment, and a button in the Passenger vestibule. Power was provided by a battery located in the Motor compartment, and a jumper cable and plug were provided on the trailing end of the Railmotor to connect to a similar system on an Autotrailer when this was coupled to the Railmotor. 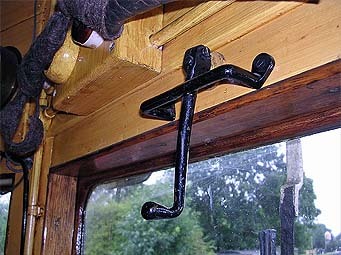 This cable was provided with a stowage socket located below the end window on the left side of the Railmotor, but most photographic evidence shows the cable left hanging below the buffer and ‘swinging in the breeze’. 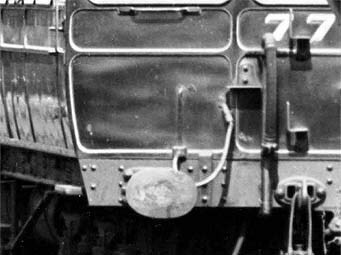 A view of the jumper cable fitted to Railmotor No 77 seen curled upwards behind the buffer and (unusually) stowed in its socket. 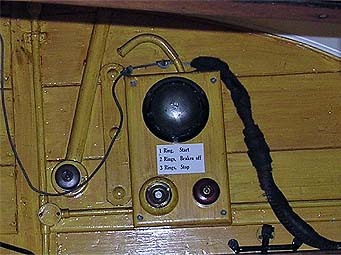 Bell codes originally were One ring to start, Two rings to stop, and Three rings to release the brakes, but were altered in 1936 to those shown in the photograph, which was taken in the Society‘s Autotrailer 190. 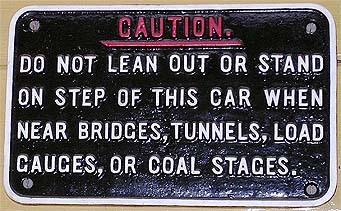 An example of the original cast iron sign that was attached adjacent to the bell and push button is shown in the ‘Signs & Notices’ feature of this section. In marked contrast to the rather austere and functional interior of the vehicles, the GWR added just a hint of luxury in the form of hand carved corbels attached to the ends of the main roof hoops in the passenger saloons. 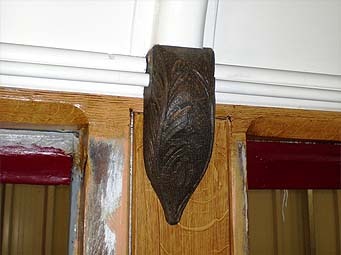 These corbels would have been more appropriate in coaches such as the ‘Dreadnoughts’ or ‘Super Saloons’. None of these corbels seemed to have survived into preservation, and the photo shows our best guess of how they looked based on available photographic evidence. You may have thought when travelling in a British Railways Mark 3 coach that the small tip up seats, for use by passengers, situated in the coach vestibules were a good idea, and were the result of a brain-wave by some ‘switched on’ person in the design department. 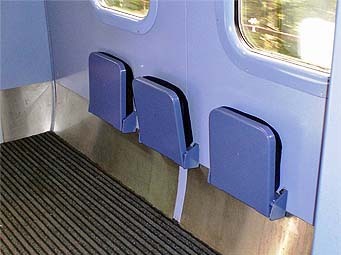 The picture on the left shows this type of seat fitted to a First Great Western coach kitted out in c.2006/7 specification. Yes the shocking blue is real – not computer enhanced! To prove that nothing is new, and that the Great Western did it first, the photograph on the right shows the same concept in the luggage compartment of a GWR Autocoach. 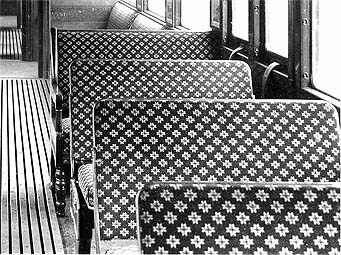 These seats, although designed only to be used when the coaches were carrying a full passenger load were nevertheless included in the vehicle carrying capacity and were officially known as ‘Drop Seats’. 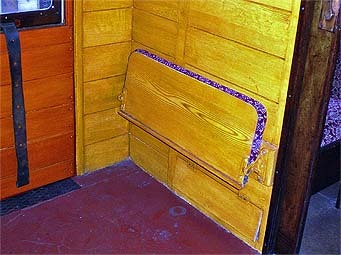 As far as is known this type of seat was fitted by the GWR only in Rail motors and Auto Trailers and was first used in 1904. A rare photo of the coal bunker hand brake control taken through the open door of the boiler compartment. 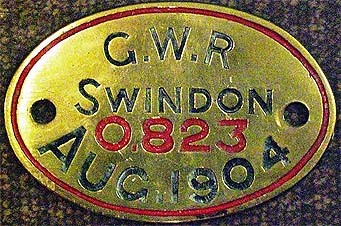 As far as is known Railmotors (and Diesel Railcars) were unique on the GWR, being the only vehicles fitted with two independently operated handbrakes. One was located (as you would expect) in the trailing driving compartment, but the other was in a bizarre location, being placed within the coal bunker in the boiler compartment. It is suspected that this brake was not used in day-to-day operation, as it would have been covered by coal for most of the time - It was normal practice to load coal as high as possible in the bunker, thus covering the handle. 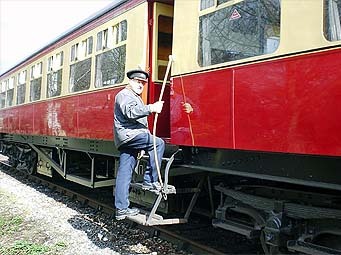 Railmotors and autotrailers were fitted with retractable steps on both sides of the vehicle to provide passengers with easy access from rail level haults (stations) on the Stroud Valley and other lines where no raised platforms were provided. 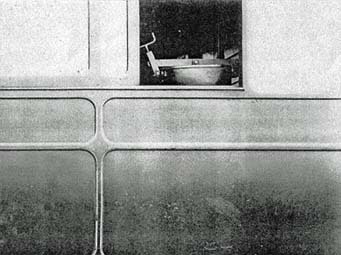 They were situated below the passenger vestibule doors, and were operated by the guard pulling a lever inside the coach. This action swung the steps outwards from under the coach to a position away from the coach body. An additional step was fixed to the solebar immediately under the door. 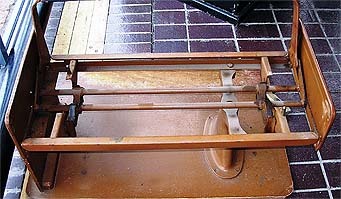 The linkage was so arranged that the treads on the retractable steps always remained horizontal. A pair of brass handrails, attached to the coach body at the top, and the step mechanism at the bottom assisted passengers ascend the three rather steep steps into the coach from ground level. The arrangement can be seen on the photograph, and it will be noted that the steps, when extended, would be prone to damage from colliding with structures such as platforms at conventional stations. The train guard always had to be alert, and retract the steps as soon as the train had departed from the hault. This pressed brass notice was fixed in various locations within the passenger saloons adjacent to the communication chains, and was the precursor of the more familiar transfer notice giving the same instruction. The £5 penalty was a lot of money in 1908! This sign was acid etched on the windows of the smoking saloons when smoking was the norm, and was used up to the time of introduction of the triangular red and white “No Smoking” window transfer in 1928 , when its use was discontinued. 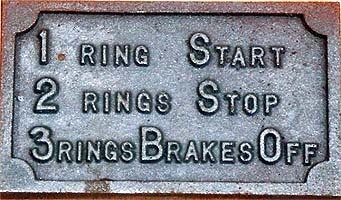 A maker‘s plate was fixed to the front of the power bogie. Its location under and behind the screw coupling meant that they often suffered impact damage. 112 power bogies were manufactured at Swindon, numbered 0801 to 0912. As can be seen this plate is from power bogie number 0823. 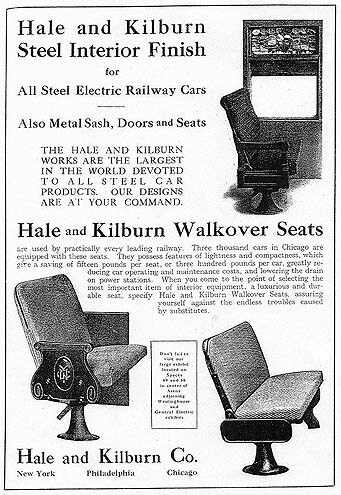 One of the remarkable features of interiors of Railmotors and early Autotrailers was the installation of seating with movable backs that allowed passengers (if they wished) to always face in the direction of travel. 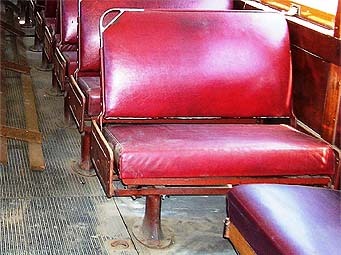 This style of seat was more commonly found in tramcars of the period, and as far as is known was not fitted to any other passenger carrying vehicles manufactured by the GWR. The style of seat fitted by the GWR was designed by Henry Safford Hale of North 6th Street, Philadelphia USA, and was patented by him under patents 3478 (1902) and 5957 (1905) They were manufactured in the USA by Hale & Kilburn who had works in Chicago and New York as well as Philadelphia. 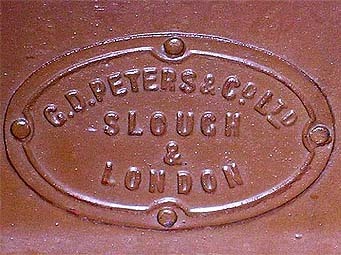 The seats were also manufactured in the U.K. by G.D. Peters & Co. who’s works stood alongside the GWR main line at Slough. 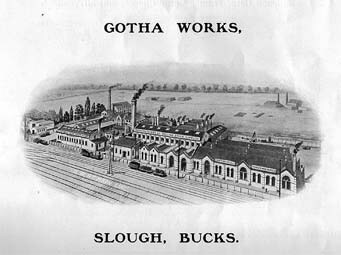 – The site was rail connected, and delivery of seats to Swindon would have been an easy matter. Steam Railmotors were originally just fitted with conventional whistles at the power end of the vehicle. However it was soon judged that this was inadequate when the vehicle was travelling with the power end at the rear. To overcome the problem a large warning gong was fitted to the trailing end. 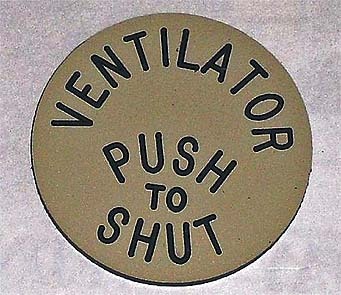 This was placed above the left hand end window, when viewed externally, and was operated by a foot pedal in the Driver’s vestibule. A similar arrangement was fitted to the driving end of autotrailers as an original feature. The photograph shows the gong fitted to Didcot’s Autotrailer Number 190. A close-up of the original filling arrangement. 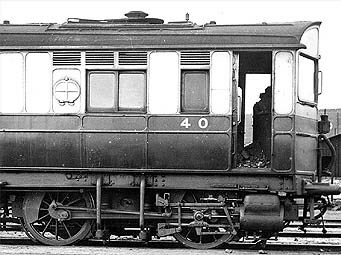 The early railmotors replenished their water tanks via a filler pipe fitted behind a sliding window within the motor compartment . This arrangement proved to be unsatisfactory as the filling hose had to be passed through the open window into the pipe. The arrangement was modified by fitting a swept bend to the pipe terminating at a hinged cover fitted externally to the coach side. 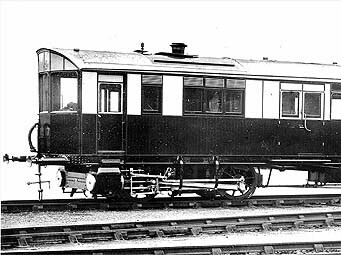 Early railmotors were modified, and later ones built with this arrangement from new. The photographs show both the original and modified arrangements. Didcot’s Number 93 was built with the modified system from new. The rail motor and autotrailer driver has to see where he is going, and in rain this originally proved difficult as the coaches were not fitted with windscreen wipers. 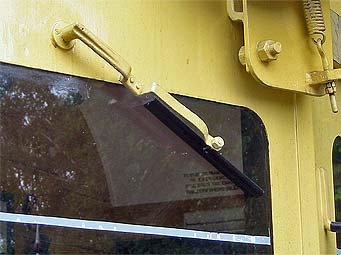 A modification was therefore soon introduced and all vehicles were fitted with wipers at the driver’s windows. However unlike modern vehicles, these were hand operated by means of a handle situated above the window.